We are local people who live and work in the town. If you'd like to make Ormskirk an even better place to live and work, get in touch and join us. Ormskirk Community Partnership is a voluntary association, established in 2009 as a "Voice for Ormskirk" , which seeks to involve local people in what goes on in our town - to give residents a chance to have their say. Our members are all local people who know they can make a difference. To pursue proposals developed through the Ormskirk Market Town Initiative. 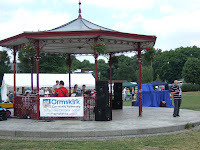 To act as a charitable organisation to promote community events, activities and developments in Ormskirk. OCP is non-party in politics and is non-sectarian in religion. Our priorities have been decided after widespread consultation with residents and local business. We have launched the Ormskirk Gingerbread Project with the help of a grants from the Heritage Lottery Fund. There are many more things we plan to do but we need more people to make things happen. If you want to make Ormskirk an even better place to live and work, please contact us through this web site or at the address or phone number on our Contact Page. Let's Make Ormskirk Even Better!